Here's more evidence that the economic recovery isn't benefitting the people who need it most: One in 5 American kids got food stamps in 2014, up from 1 in 8 before the recession. 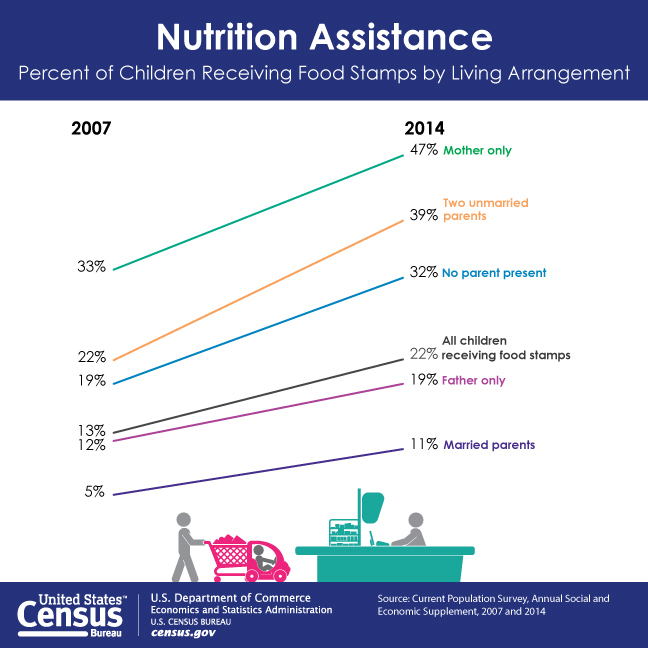 About 16 million kids relied on the U.S. government's Supplemental Nutrition Assistance Program in 2014, according to Census Bureau data released Wednesday, up from 15.6 million a year earlier. In 2007, before the start of the Great Recession, that figure was only 9 million. The Census also found that the percentage of kids on food stamps rose across all types of living arrangements. Nearly half of kids on food stamps live with only their mother. Enrollment in the food-stamp program began to steadily climb in 2007. Overall enrollment began to fall in 2013 as the economy slowly improved. Children's enrollment dipped a bit in 2013, but rebounded to new highs last year. The numbers highlight how unfair the recovery has been so far. Most of its benefits have gone to the wealthy, while middle- and low-income Americans have continued to suffer. The number of kids living in poverty, for example, has risen since the recession. According to a recent study by the Southern Education Foundation, 51 percent of U.S. public school students live in poverty, up from 42 percent in 2006. Earlier this week, the Congressional Budget Office projected that food stamp enrollment would fall steadily in the coming years. But not all of the declines will be for positive reasons: The Huffington Post previously reported that food stamp enrollment is expected to fall by 1 million next year because of rules that will push unemployed, childless adults off the program.